Lie on the back with the legs flat. Pull the affected leg up toward the chest, holding the knee with the hand on the same side of the body and grasping the ankle with the other hand. Trying to lead with the ankle, pull the knee towards the opposite ankle until stretch is felt. Do not force ankle or knee beyond stretch. Hold stretch for 15-20 seconds, then slowly return to starting position. Aim to complete a set of three stretches. Sit on the floor with the legs flat. Raise the affected leg and place that foot on the floor outside the opposite knee. Pull the knee of the bent leg directly across the midline of the body using the opposite hand or a towel, if needed until stretch is felt. Do not force knee stretch to the floor, hold stretch for 30 seconds, then slowly return to starting position. Aim to complete a set of three stretches. 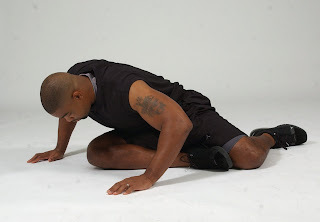 Lie on the floor with the affected leg crossed over the other leg at the knees and both legs bent. Gently pull the lower knee up towards the shoulder on the same side of the body until stretch is felt. Hold stretch for 30 seconds, then slowly return to starting position. Aim to complete a set of three stretches. Begin on all fours. Place the affected foot across and underneath the trunk of the body so that the affected knee is outside the trunk. Extend the non-affected leg straight back behind the trunk and keep the pelvis straight. Keeping the affected leg in place, scoot the hips backwards towards the floor and lean forward on the forearms until deep stretch is felt. Do not force body to floor. Hold stretch for 15-20 seconds, then slowly return to starting position. Aim to complete a set of three stretches. If you feel your piriformis muscle tense, you can sit on top of a tennis ball (the tennis ball should be directly below the tense point), and perform circular movements with your hips, paying attention to keeping the ball under the tense point at all time. This will help relief the tension build up on that muscle and, by doing it so, it will reliefvethe pressure on your sciatic nerve, drastically reducing your pain symptoms. Great post. Very informative and well written about physical therapy, NJ. Good job. 1. Drink a LOT of water. Stay hydrated as much as possible. Our body is made up to 60% water so it just simply makes sense. 2. Follow the guide I used in treating sciatica naturally (guide here). Please be consistent in following. This is the most important part. 3. Lastly is to eat peanuts everyday to loosen up the muscles surrounding the sciatic nerve. Again, be consistent in following the guide and good luck! Cheers!